Kostova's masterful new novel travels from American cities to the coast of Normandy, from the late 19th century to the late 20th, from young love to last love. The Swan Thieves is a story of obsession, history's losses, and the power of art to preserve human hope. Outside the village there is a fire ring, blackening the thawing snow. Next to the fire ring is a basket that has sat there for months and is beginning to weather to the color of ash. There are benches where the old men huddle to warm their hands  too cold even for that now, too close to twilight, too dreary. This is not Paris. The air smells of smoke and night sky; there is a hopeless amber sinking beyond the woods, almost a sunset. The dark is coming down so quickly that someone has already lit a lantern in the window of the house nearest the deserted fire. It is January or February, or perhaps a grim March, 1895  the year will be marked in rough black numbers against the shadows in one corner. The roofs of the village are slate, stained with melting snow, which slides off them in heaps. Some of the lanes are walled, others open to the fields and muddy gardens. The doors to the houses are closed, the scent of cooking rising above the chimneys. At the beginning of Chapter 2, psychiatrist Andrew Marlow confesses that the story he is going to tell is not only private but subject to my imagination as much as to the facts. In what ways does this prove to be true, in the course of the book? How does Marlows imagination affect the telling of his own story? Each of the artists in the bookRobert, Marlow, Mary, Kate, Béatrice, and Olivieris faced with choices between art and personal life. What are some of these dilemmas, and how does each character resolve or at least experience them? Elizabeth Kostova's second novel will delight some readers and disappoint others... despite the odd handling of the characters' back-stories and a certain flatness to those characters, I came away feeling moved. Among the many pleasures found in The Swan Thieves are Kostova's exquisite descriptions of paintings and the window she gives the reader into the world of painting, including all of its grueling physical labors along with the exhilaration that results when inspiration and execution create great works of art. Her historical detail of the Impressionist period is beautifully done. Finally, she left me with much to ponder - rather in the way a painting can keep you looking and finding more the longer you look. (Reviewed by Judy Krueger). [A] soap opera filled with overheated passion and romantic twaddle, much of it preposterous... [Kostova] has worked hard to construct an elaborate fiction of intertwining lives, but the whole situation in which the characters intertwine feels contrived, and they cross as the result of too much coincidence. Kostova, like Marlow, is clearly intrigued by artistic obsession and passion; what a loss that neither manage to break the surface or offer true insight. There’s a decent 300-page book trapped inside this 564-page tome. And inside that, perhaps, lies the inspiration for a lively screenplay. Even the most successful novelists, as it turns out, need a good editor. The many ardent admirers of The Historian, Elizabeth Kostova's 2005 first novel, will be happy to learn that her second book offers plenty of the same pleasures... [but] Part of Kostova's point here, unfortunately, is that the human response to nature and art is uniform and unchanging. It's unfortunate because this theme, plotted and peopled over nearly 600 pages, has produced a homogenizing effect: If the dead people here seem reasonably animated, the live characters also seem somewhat deadened, smoothed out, impersonal. Kostova uses words exactly as painters use oils, laying down brushstrokes and tiny layers that at first seem disconnected and abstract, but that eventually coalesce into a glorious whole. [A]n understated, beautifully written tale of art, love and an obsession triggered by both. The Swan Thieves also shows the same meticulous historical research and scene-setting description that elevated The Historian from a vampire tale to a work of art... While most of the book is set in the modern era, the 19th century passages make it a must read for lovers of historical fiction. Kostova’s new novel is considerably less bloody [than The Historian] but every bit as thought-provoking and suspenseful. ...The Historian... was a smash hit, a vampire-romp that capered across Europe dragging its breathlessly giggling readers in its wake. The Swan Thieves... will also leave its readers laughing, but for all the wrong reasons. As a portrait of a monster with a heavenly gift, the novel is interesting. But it is simply far too long, and rarely achieves real emotional authenticity... Readers expecting the delights of The Historian, beware. [F]or all the talk that this is a book about obsession and love, the most disappointing thing about The Swan Thieves is the slightly creepy fact that, within its way too many pages, innocent young women keep falling for the stereotype of the experienced and wise older man, so that in the end it reads more like Woody Allen turning his hand to literary fiction than any serious threat to the writers of the Victorian era which Kostova so clearly cherishes. Neither Robert's decisions nor Marlow's make a lot of sense, but lush prose and abundant drama will render logic beside the point for most readers. Starred Review. ... sure to be a best seller and a suitable choice for book clubs. Highly recommended. The Swan Thieves succeeds both in its echoes of The Historian and as it maps new territory for this canny and successful writer. I loved this book from the beginning. The descriptions were so real and I felt the torment of the psychotic artist and the people who loved him. The parallel stories of the 19th and 20th centuries were well done. One of the key themes in The Swan Thieves is the challenge of male and female artists who form relationships and must navigate the storms of artistic temperament and genius. The theme could be looked at as a genre or perhaps a subgenre of novels about art/romance. The torturous love affair and marriage of two musical geniuses: Clara and Robert Schumann. Clara maintains her talent and drive despite her husband's fame and depression, but sacrifices her own fame for him. 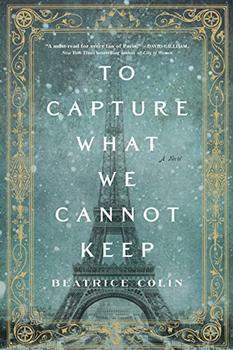 Set against the construction of the Eiffel Tower, this novel charts the relationship between a young Scottish widow and a French engineer who, despite constraints of class and wealth, fall in love.